The passing of the Tasman District Council (Waimea Water Augmentation Scheme) Bill has cleared the way for the construction to begin on the largest dam to be built in New Zealand for more than 20 years, Nelson MP Nick Smith says. “The Bill passed by 112 – 8 votes and clears the way for a sustainable solution to the regions long standing water problems. “The passage of this Bill concludes a 17-year tortuous process for developing and gaining approval for a sustainable solution for the regions water problems. This Bill resolves the last issue of access to the conservation and LINZ land. . .
Rangitikei MP Ian McKelvie is pleased that his Sentencing (Livestock Rustling) Amendment Members Bill has been adopted by the Government as a Supplementary Order Paper on the Crimes Amendment Bill. “Stock rustling is a crime that cuts to the heart of many rural families and the farming community. “Theft of livestock from farms or property is estimated to cost the farming community over $120 million a year. More recently, the risk to farms of Mycoplasma bovis spreading through stock theft has added strength to the call to take action. . .
Fonterra’s suppliers will be choking on their Xmas rations, as they digest the price blows the co-op has delivered. First, the dairy giant has revised down its forecast milk payout range for the season to $6-$6.30 from the earlier $6.25-$6.50, and, second, it is clawing back some of the $4.15/kg advance payment rate. Farmers in January will be paid $4/kg for the milk they supplied in December plus the co-op is clawing back 15c/kg for all the milk supplied between June and November. It is not surprising that farmers with costs of production running at or above $6/kg are reported to be “shocked” and “angry”. Even those efficient operators who have lower operating costs won’t be happy with Fonterra saying it “appreciates” the budgeting impact the updated $4 advance rate will have on farmers in January. . .
Stuff recently gave space to an opinion piece from Glen Herud, a dairy farmer, which had a number of inaccurate references to the use of nitrogen in horticulture and horticulture practices in general (Stuff, December 4, 2018). It is important to note, the primary industries are working together to address both the real and the perceived impacts of food production on the environment. At Horticulture New Zealand, we are sitting down and talking to key Government Ministers and their officials from the relevant government agencies to look at the best ways to clean up waterways and address climate change. This is how the best policies will continue to be made. In his opinion piece, Mr Herud’s numbers and references to research are unsubstantiated. I don’t want this to be a science class, but there is a lot of misinformation about nitrogen being spread around and it is essential to deal in facts, backed by science. . .
Michael McCombs has had success by putting himself out therein the NZ Dairy Industry Awards, FMG Young Farmer of the Year contest and the Young Farmers Excellence Awards just by doing his thing and loving the journey along the way. Samantha Tennent reports. A geography class trip sealed the deal for Michael McCombs – he knew dairy farming was where he wanted to be. He grew up in Upper Hutt, attending Upper Hutt College and from a young age had always planned to become a farmer. It was a 220-cow farm near Carterton he’d visited with school and thought to himself he’d love to work there. The following summer holidays he did. It was a once-a-day herd and the owner, Dave Hodder, recommended Michael look at the Taratahi training farm. “I wasn’t enjoying school and was looking at my options. I landed a spot on the training farm so left school at the end of year 11.” . .
Privately-held New Zealand engineering company Milmeq Limited, a designer and manufacturer of meat processing equipment, will be split and sold in the coming months, but it doesn’t mean the end of the brand. An agreement was signed at the end of last week for the sale of Milmeq’s chilling and freezing capability to New Zealand-listed company Mercer Group Limited, effective from 1 March 2019. Chairman Ralph Marshall describes the sale as a good move for staff, customers and suppliers. “Being purchased by a publicly-listed company, with a range of complementary products, positions Milmeq equipment well for future growth. We have been nimble over the years, always innovating to meet market needs, but we anticipate this innovation will further accelerate under the new owners.” . . The number of New Zealand farmers taking their own lives is at the lowest point since provisional records began, according to the latest Ministry of Justice statistics. Figures obtained by Newshub show in the year to June, 18 people who work in farming-related occupations committed suicide, compared with 27 in the previous year. In fact, the latest numbers are the lowest since figures were first collated in 2007/08. . . If AgResearch scientist Jenny Juengel had to write a job description for her ideal job, she reckons she would come up with her current position. Dr Juengel, recently named one of 19 new Fellows of the Royal Society of New Zealand, is principal scientist with the reproduction team, based at Invermay. Living in Otago meant she was a long way from where she grew up on a dairy farm in Michigan in the United States. It was that upbringing which she attributed to whetting her interest in agricultural research, particularly reproductive research, as she became interested in why some cows failed to become pregnant. . .
Canterbury irrigators are being reminded to only turn their irrigators on when necessary as on-going wet and relatively cold temperatures in many parts of the region reduce the requirement for early season irrigation. “Farmers need to record the sporadic rainfall we’ve been experiencing and monitor their soil moisture levels closely. Keeping a check on any predicted rainfall is also key. Not irrigating until you need to reduces operational costs and increases profitability.” . . The race to represent Taranaki/Manawatu in New Zealand’s most prestigious primary industries competition has begun. The first district contest and skills day for the 2017 FMG Young Farmer of the Year was held on Saturday near Stratford. Twelve contestants were put through their paces by judges assessing their agricultural knowledge and practical skills. They included Michael McCombs, Alana Booth, George Watson and James Beattie from Marton Young Farmers. . . When you’re raising big, strong and healthy looking heifers to bring into the milking herd, it can be extremely frustrating when they fail to fire. That’s what was happening for northern Waikato farmer Verena Beckett and she was keen to find out what was holding the first calvers back. Beckett runs a 400-cow dairy herd on her father’s 160-hectare property at Rotongaro, west of Huntly. But it was on her own adjacent 165-hectare farm, also running 400 Friesians, where the trouble was brewing. Her replacements are raised as part of a grazing scheme run by Franklin Vets (Te Kauwhata) on a separate sheep and beef property northeast of Te Kauwhata. They were, according to veterinary technician Jess Kingsland, “monster” heifers in great condition. But the naturally mated animals were experiencing empty rates of 8–10 percent and calving was very spread out. . .
Efforts by primary stakeholders, helped by the rising prevalence of technology in the horticultural sector, appear to be paying off as more and more young people enter the industry. Initiatives such as the Young Horticulturist of the Year 2016 Competition – to be contested on Thursday this week – andT&G Pipfruit’s annual Young Fruit Growers recent competition, which attracted spectators from Hastings Girls High School, are helping to change perceptions and generate excitement about careers in one of New Zealand’s more profitable primary industries. T&G is a major partner of the national Young Hort competition, but also runs the company’s internal competition for young orchard workers as a pathway to the pipfruit . . sector contest (whose winner goes on to the national contest for New Zealand’s best young horticulturist). . . .
Why did the cows return to the marijuana paddock? 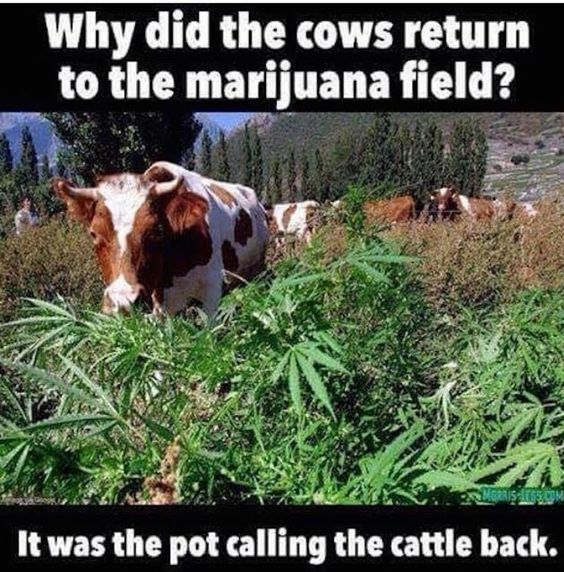 It was the pot calling the cattle back.